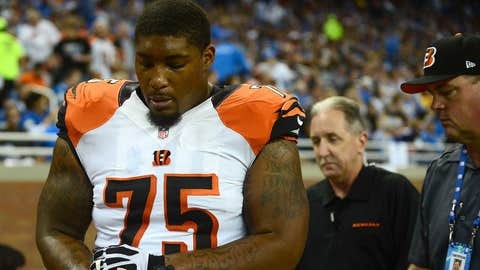 Bengals defensive tackle Devon Still missed four games at midseason with an injured elbow and the past two with a herniated disc in his back. CINCINNATI (AP) — The Bengals put tight end Alex Smith and defensive tackle Devon Still on injured reserve Monday, getting their roster ready for the playoffs. Smith suffered a dislocated wrist during a 34-17 win over Baltimore on Sunday. He played in all 16 games and had three catches for 12 yards. Still was part of the defensive line rotation and played in 10 games. He missed four games at midseason with an injured elbow and the past two with a herniated disc in his back. The Bengals signed defensive tackle Ogemdi (oh-GEM’-dee) Nwagbuo (new-WAH’-bo), a fourth-year player who was with the Lions in preseason. He also has played for San Diego and Carolina. Cincinnati (11-5) hosts San Diego (9-7) on Sunday.